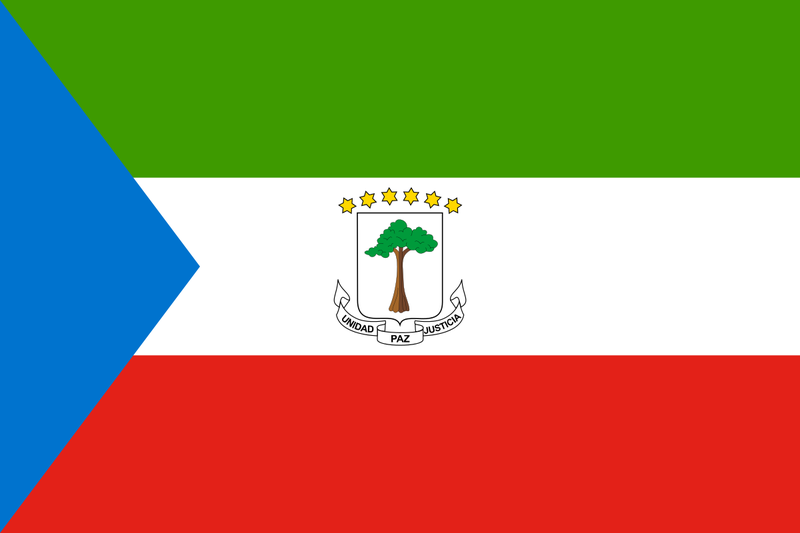 Before we get into the flag, let's take a quick peek at the 4-1-1 on Equatorial Guinea itself. It's got two parts- the insular/island parts (the islands of what used to be Fernando Po but is now Bioko and Annobon) and the mainland enclave of Rio Muni. The islands were first discovered by the Portuguese Explorer, Fernando Po- hence the name- in 1472 and were initially colonized by Portugal in 1474. In 1778, however after the Treaty of El Pardo- Bioko and it's neighbors, the commercial rights to the Bight of Biafra between the Niguer and Ogoue Rivers were all ceded to Spanish control and up until 1810, the territory was governed by the Viceroyalty of the Rio de la Plata based out of Buenos Aires. The British occupied Bioko between 1827-1843, before moving on to Sierra Leone. Despite the original treaty awarding them control of large chunks of land along the Bight of Biafra, Spain hadn't bothered doing anything with it, so France sort of moved in and in the Treaty of Paris, signed in 1900, penned them into the relatively tiny enclave of Rio Muni. And that's pretty much how Equatorial Guinea got to be the shape it is. Post-independence, things did not get especially cheerful for Equatorial Guinea. They've had two, count them two Presidents- neither of them very pleasant people- and despite having discovered a ton of oil there in 1995, economic development has yet to advance as current Dictator/President for Life Teodoro Obiang is keeping all the oil money for himself and currently (As of February 2016) holds the title of Africa's longest serving dictator. So: it's an interesting outlier because it speaks Spanish, but you probably wouldn't want to live there. But onto the flag! It was adopted on August 21st, 1979. Under the rule of Equatorial Guinea's first dictator, Francisco Nguema, a different national emblem was used in the center of the flag- this emblem was replaced following his ouster. It's a horizontal tricolor with green, white and red stripes and a blue triangle to the hoist. Green stands for the natural resources, agriculture and jungles of the country. Blue stands for the sea which connects the main country with the islands. White is for peace and red for the blood shed by the fighters for independence. And that, folks, is Equatorial Guinea.